Should you take a probiotic with your antibiotic? We are not one organism, we are many organisms. And when we disturb the relationship with our symbiotic partners, we can suffer unpleasant and sometimes life-threatening consequences. One of the most fascinating areas of medical research is the study of how our bodies interact with the the various organisms that we carry around, on us and in us. A focus is the gastrointestinal tract, particularly how the composition and function of those organisms contribute to what we think of as “normal” function, and how they can affect our risk for obesity and disease. My favorite analogy is from Science Based Medicine’s Mark Crislip who likens it to a “metaphorical rainforest” giving a vivid mental image of the of the number of species (thousands) in our guts, and the complexity of that ecology. If the gastrointestinal tract is a rainforest, then antibiotics are the metaphorical clear cutters, wiping out some of the normal bacteria, and creating the conditions where unwanted bacteria can grow. Antibiotics are among the most useful (if not the most useful) classes of drugs in widespread use today. They’re also among the most widely prescribed, and both antibiotic overuse and their addition to animal feed present real dangers to their ongoing effectiveness. Their popularity stems in part from their effectiveness, but also from the perception that they are safe. And, in general, a course of most antibiotics is usually well tolerated. Among the side effects, diarrhea is common (with an incidence of 5% to 39%). It’s due in part to the antibiotic killing off our normal “good” bacteria, which can significantly change the most prevalent species. In some cases, “bad” bacteria can surge as a result. Clostridium difficile infection is pretty much the worst gastrointestinal consequence of antibiotic therapy. It isn’t just a cause of antibiotic-induced diarrhea, “C. diff” infections are virulent and vicious, spreading easily, especially among hospitalized patients, causing widespread misery and even killing.Probiotics are some of the more interesting of the “complementary and alternative” products out there, because they’re among the more plausible. Probiotics are bacteria and yeast that are administered to replace the bacteria killed by other means, with the goal of reducing the risk of diarrhea and the chance of serious infections from pathogens like C. diff. But plausible doesn’t mean valid – remember the idea that antioxidant vitamins would be beneficial? Or preventing arrhythmias would reduce mortality? Science has repeatedly shown the hazards of making assumptions of benefit in the absence of clear evidence. Given the complexity of the body’s ecosystem, it’s reasonable to be skeptical of the concept of probiotics. Again, Crislip’s analogy of probiotics to be akin to “planting corn in a rainforest” is one that resonates. Plausibility is one thing, a demonstrable effect is another. For that, we need to see the evidence. Proponents of probiotics liken their effect to some sort of bacterial and mycological panacea, providing benefits that range from nonspecific (“wellness”) to promising (prevention of respiratory tract infections) to the somewhat more established uses, like the prevention of antibiotic-associated diarrhea (AAD). To keep the topic focused, I’ll consider a typical use: starting a probiotic when you start an antibiotic, with the goal of preventing diarrhea. For the sake of simplicity and to make this relevant, let’s assume you’re not hospitalized, nor do you have any underlying gastrointestinal disease, like Crohn’s. Let’s assume you’ve been prescribed oral antibiotics for an infection that’s usually treated at home, such as a urinary tract infections, a skin or soft tissue infections, or a lung or other respiratory tract infection. Is the use of a probiotic a good investment for you? Reviewing trials with probiotics is complicated by an array of studies, endpoints, prior antibiotics, patient populations, and the quality of the studies. The result is a number of endpoints that a few authors have attempted to systematically evaluate with meta-analyses. Admittedly a meta-analysis is not the ideal tool under these circumstances, but it does give a sense of the overall evidence base. Hempel’s meta-analysis, published in 2012, is the most recent review. It looked at 82 studies and combined the results of 63 RCTs, giving a sample set of almost 12,000 patients taking antibiotics, comparing probiotics to placebo or no therapy. Probiotic species included Lactobacillus, Bifidobacterium, and the yeast Saccharomyces. The overall findings were impressive. Those taking probiotics had a 42 percent lower risk antibiotic-associated diarrhea. Based on this analysis, 13 people who would otherwise experience AAD need to take probiotics to prevent one. So it’s not a panacea, but as interventions go, this is a good number needed to treat (NNT). Subgroup analysis, including an analysis of the highest-quality trials, didn’t change the effect size significantly – the effect was also consistent in both adults in kids, though it was non-significant in seniors. Of the studies that collected adverse event information (23) none were noted, which is reassuring but makes me skeptical that this information was collected accurately. It should be noted that most trials were sponsored by manufacturers, introducing an additional potential bias in the individual studies that would be reflected in these results. Hempel’s review is not the first meta-analysis of probiotics for AAD. Its conclusions are broadly in line with Sazawal, D’Souza, Van Niel, Szajewska and McFarland. There is also the 2011 Cochrane review by Johnston that looked specifically at probiotics to prevent AAD in children, selecting 16 trials of over 3400 patients. Despite the numerous data quality issues, it concluded that there is likely a beneficial effect from probiotics, but the overall quality of the evidence for the primary endpoint (incidence of diarrhea) was low. It calculated an NNT of 7, even more impressive than Hempel’s review. Again, no serious side effects were associated with probiotics. The review called for more studies to better establish the appropriate probiotic species, dose, duration and side effect profile. The other recent meta-analysis is from Videlock in 2012, pulling together 34 studies with over 4000 patients. Species included Lactobacillus, Enterococcus, Streptococcus, and the yeast Saccharomyces. It estimated the overall relative risk of diarrhea when taking probiotics to be 0.53 (95% CI 0.44-0.63), suggesting an NNT of 8 (95% CI 7-11). Both of these estimates are difficult to interpret given the diversity of trials and endpoints in the included studies. Problems in the analysis included the suggestion that the results are positively biased because of negative trial bias. Side effects were not notable. Overall, positive findings but the limitations in the data suggest that we need to accept these estimates of efficacy with some caution. When probiotics are given specifically to prevent C. diff infections (versus just diarrhea) the Hempel analysis suggests that there is expected to be a net benefit. A 2013 Cochrane review by Goldenberg suggests that probiotics can reduce the risk of infection by 64%. There are also reviews by Ritchie and Bradley that suggest a net benefit. Again, the merits really depend on the likelihood of a C. diff infection, which is relatively unlikely in the otherwise healthy, unhospitalized person. Whether the effect of a probiotic differs depending on the type of antibiotic taken or for how long the antibiotic is taken. Keeping in mind that the effect of probiotics is both strain- and disease-specific, physicians should consider recommending probiotics to prevent antibiotic-associated diarrhea. The European Food Safety Authority has reviewed many probiotic products for treatment claims made by manufacturers. A review of any of their evaluations illustrates the problems with the individual trials that make up the probiotic evidence base. Reviews point out methodological weaknesses that preclude conclusions about cause and effect. They also criticize manufacturers for not demonstrating that the product they are selling is identical to the product studied in their clinical trials, which is a necessity if manufacturers want to infer efficacy from these studies. Given the diversity of products studied, patient populations and the underlying quality of the data, it’s difficult to make a single statement about the potential harms. However, it is reassuring that there is little evidence in the literature to suggest that probiotics are harmful. The exception seems to be those with weakened or compromised immune systems, where serious cases of infection have been observed. And once you have antibiotic-associated diarrhea, the case that can be made for probiotics is less clear. The weak regulatory structure for probiotics makes quality control more questionable that you would find for prescription drugs. The degree to which consumers can expect a reliable product is not clear. Analyses have shown that labels may be inaccurate with respect to types and quantities of species included. Variations from the label have been observed in other studies, too. This may introduce the risk of an infection from an undesirable species. On balance, probiotics have a good safety record and clinical trials of moderate quality suggest that they may reduce the risks of antibiotic-induced diarrhea. 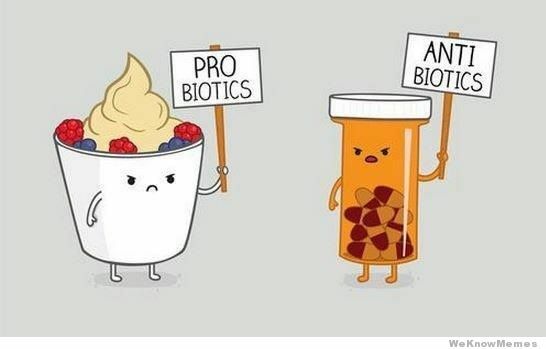 Whether or not probiotics should be recommended routinely is still a matter of debate. There is still a lack of information about the most effective species, the optimal dose, and the timing of product. While there remains contradictory data, there seems to be enough evidence to suggest that there is a net beneficial effect. No standard doses exist, nor does the optimal duration of treatment, though most studies evaluated supplementation during the duration of the antibiotic therapy. I haven’t covered specific brands of probiotics at all in this post. (Some are discussed in Dr. Crislip’s post.) Frustratingly there is a lack of good data to help distinguish which brands and species of probiotics are demonstrably and reliably effective, or if one is superior to another. There is no head-to-head data to compare formulations. There are many claims that the multi-species formulas are superior, but this hasn’t been clearly shown to be the case. Yogurt is often suggested as a source of healthy bacteria. However, the probiotics used to ferment milk (L. bulgaricus and S. thermophilus) are not believed to survive the trip through the gastrointestinal tract. Acid-resistant probiotics (e.g., L. acidophilus) added to yogurt can make the product an effective probiotic source. Depending on where you live you may also see yogurt-like fermented dairy products such as DanActive and Bio-K Plus in your grocery store, created to provide a source of probiotics. Costs vary dramatically. A Canadian review noted the 14 day costs of probiotics with the best evidence for C. diff prevention ranges from $13 (for Bio-K+) to $112 (for VSL#3). Importantly and probably most frustratingly, the lowered safety and quality bar in place for “supplements” regulated (I use that term loosely) under the DSHEA makes it difficult to identify a preferred product. It’s not clear that what’s on the label is actually on the bottle, especially when it comes to live bacterial cultures. Even industry insiders note the problems with the manufacturing quality of these products. ← Ask the (Science-Based) Pharmacist: What are the benefits of coffee enemas?